Share "Suggestions to Help Your Cat Lose Weight"
Obesity is one of the most common health issues afflicting pet cats, and being overweight or obese can severely compromise the health, quality of life and even lifespan of your cat. Taking steps to help your pet shed excess pounds isn't difficult, but it does need to be done carefully to keep your cat happy and healthy. With so many unhealthy consequences to carrying around a few extra pounds, helping your cat lose weight can be critical for your pet's well-being. Two principle factors influence overweight cats – eating too much and exercising too little. Adjusting both your cat's diet and its activity level can help your pet lose weight, but be sure to consult your veterinarian before making any major changes to your cat's lifestyle. Your vet can help determine just how overweight your cat may be and can recommend a target weight to aim for. Provide 2-4 small meals each day, but avoid "bottomless feeding" with a bowl of kibble or other food available around-the-clock. It is essential to monitor your cat's meals to be sure your pet is not ingesting too many calories, and an always available food source makes it difficult to avoid overfeeding. Gradually shift your cat's diet away from a high-carbohydrate diet of dried food to a diet of canned food higher in protein and water. Carbohydrates are empty calories for cats, but protein is better for good energy and active muscles. More water will promote better digestion and urinary tract health. Minimize or eliminate treats from your cat's diet, or conscientiously count treats to be sure you are not overfeeding your cat outside mealtimes. Small pieces of cooked chicken are great treats that have fewer additives and preservatives, but do not offer so many treats that your cat's calorie intake is too high. 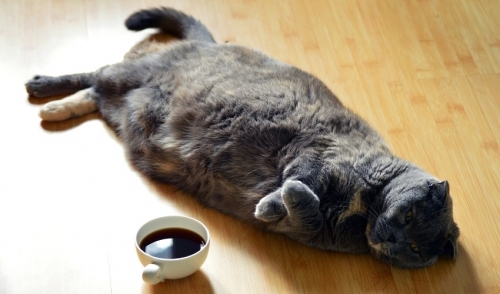 Consider using cat foods formulated for overweight cats. These foods are generally designed not only to provide a proper balance of essential nutrients and minerals for your cat, but are lower in fat and carbohydrates that can lead to weight gain. Restrict your cat's access to all other food sources to prevent extra snacking. Do not leave dog food available, and never offer your cat any human food or allow them to clean off dirty dishes. Similarly, if your cat goes outdoors, be sure they aren't munching on outdoor foods or hunting for their own snacks. Provide your cat with an intriguing, multi-level kitty condo to explore. Climbing different levels, scratching at posts, jumping on and off lounging shelves and otherwise wandering around their condo will help build muscle and burn calories. Hide food and treats to encourage your cat to exercise. This also simulates natural hunting and helps your cat satisfy their predatory instincts in a safe way. The more they have to work for their food, the more calories they will use before they eat it. Create plenty of play time with your cat and use different activities to get them moving. Toys such as feathers attached to strings, balls with rattling bells and even that pesky laser pointer can all help your cat get more exercise, and they will enjoy the bonding time with you. Consider getting another cat to provide a playmate for more activity and interaction. The cats will play with one another and that extra activity will help keep both pets fit. Your cat can even make a new friend with other types of pets, and all activity will be helpful. Try walking your cat. It may not be easy, but some cats can learn to be happy in a harness and leash, and going for walks outdoors will not only provide more exercise, but will be mentally stimulating with different sights, smells and sounds as well. Use multiple techniques to help your cat lose weight, but monitor weight loss carefully. Gradual loss – 1-2 pounds per month – is best. If your cat loses a great deal of weight suddenly, or if you are using several tactics but see no change in your cat's weight, consult your veterinarian to be sure there is no other problem behind your cat's weight issues. With care and diligence, you can help your feline friend reach a healthy weight to lead a happier, more comfortable, longer life.